When builders build condos, they do it on the cheap. Especially when the market is ripe and it the money is there for the pickin'! When that little scenario occurs, they build quickly and (again) cheaply. This is what happened in 2005. A pale yellow "Navajo White" welcomes all the guests as they enter the unit, along with some 12" tile with this awesome aztec mosaic-looking "fancy" pattern in the tile. I felt like I was walking into a mountain lodge, not a beach condo. Navajo white walls with that awesome tile work! Testing Glidden "Song Porcelain" to brighten the place up. It was a winner! Since budget was an issue, I decided that a rug to cover the tile would be a nice, easy fix, and new paint was in order. I wanted something light, bright, beachy, and cottagy! And I found a winner with with Glidden's "Song Porcelain". Paint is such an awesome, inexpensive way to make over a space! 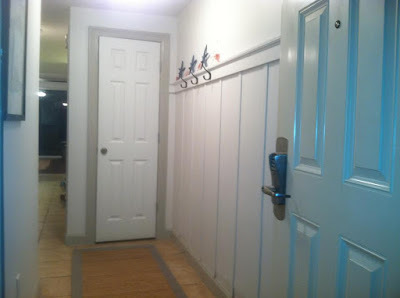 But it still needed something more....... After perusing MANY DIY blogs, I determined that my life and this condo would not be complete until I gave the entryway the "board and batten" treatment. Lucky for me, my dad was a shop teacher and I grew up using power tools and saws. The real problem here was having to deal with a concrete wall. So, I used Liquid Nail construction adhesive to hold up my 1x4. That was fun. Then I cut myself some 12" spacers and went to town with the liquid nail and battens that I cut. The 1x4 horizontal board and lattice battens. And there's that lovely round mosaic tile again! And another view of my hard work. I'm just loving the white on the walls. That Navajo white is still peaking at me from around the door. SO glad it's gone! After installing my horizontal board & battens, I added my 2" ledge to the top of my horizontal board, then trimmed it out with some nice cove molding. Throw on some caulk, and some more paint, and the place REALLY started coming together! I didn't want to leave the baseboards and trimboards white. They get dirty, banged up, and show dirt. So I painted all of the trim and baseboards "Roma Haze". It is the perfect accent to the "Song Porcelain", and brings out a hint of blue in the paint. two hooks, looking pretty. And it's time to say good bye to that Navajo White! My three little hooks. Accented by three little starfish. Ready to greet our guests! Although the entryway was looking TRULY awesome, I thought it still needed a little more. My new Pottery Barn sisal rug arrived, and I was very inspired by the blue smoke border, as this would be an accent color throughout the condo. So I decided to spray paint my starfish blue. I highly recommend spray painting starfish to make them pop! Before, they kind of got lost in the white. Now they draw the eye and look awesome! I also decided to alternate some small coral-colored sea fans. I love the look! And here is the final result....painted starfish, walls, board and batten, and rug! 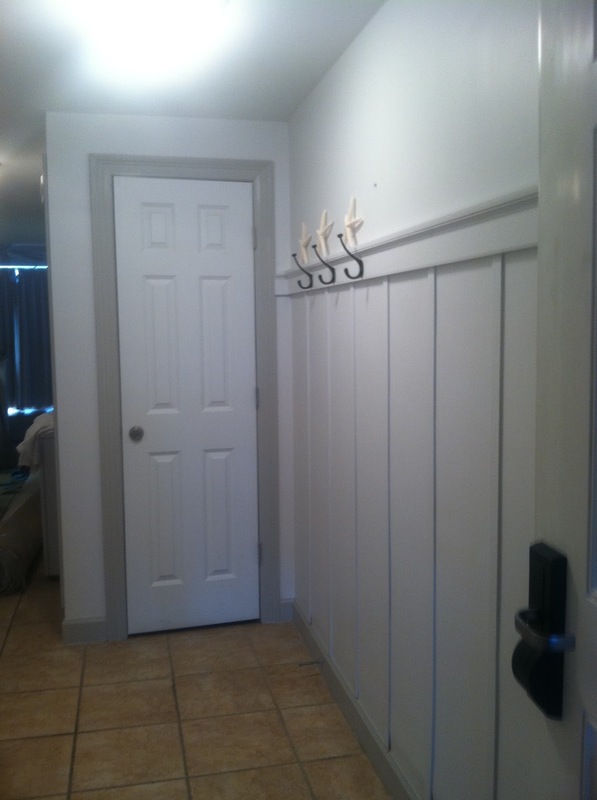 Welcome to our Cottage Condo at the Boardwalk Beach Resort in Panama City Beach, FL!